Mike DeMiccos expansive embrace of music has led him to work with prominent artists in many genres. Hes toured the world extensively since 1980, performing and recording with a diverse cross-section of jazz, blues and popular artists, including Dave Brubeck, The Brubeck Brothers Quartet, Jack DeJohnette, Nick Brignola, Warren Bernhardt, Lee Shaw, Rory Block, James & Livingston Taylor, Professor Louie and The Crowmatix, and many others. Mikes selected performance highlights include appearances on PBS and NPR; at the major European and North American jazz festivals; and at prestigious clubs and venues such as The Kennedy Center, Ronnie Scotts, LAs Jazz Bakery, The Blue Note, Birdland, The Five Spot, The Bottom Line, Wolf Trap, Great American Music Hall, and BB Kings. Besides being an in-demand sideman, Mike has led his own jazz group since 1987, and also co-leads an organ trio with Hammond B-3 player Pete Levin. Mikes new CD, As The Sun Sets (Blue Forest), features longtime musical mentor, pianist Warren Bernhardt, bassists Jay Anderson and Rob Leon, and drummer Peter OBrien. All About Jazz calls this recording all progressive, creative quartet jazz. Its straight-ahead, but with a contemporary feel . . . DeMiccos compositions are complex, intricate and original vehicles. (He) possesses a fluid, melodic style and excellent technique and taste. When hes not working with his own group, Mike is guitarist and composer with the Brubeck Brothers Quartet, led by Chris and Dan Brubeck. Mike co-produced the BBQs new release, Intuition (Blue Forest), which includes two of his compositions, West of One and Open Door. He has toured the U.S. with the BBQ since 1997, offering concerts and clinics from The National Gallery of Art in DC to the famed San Francisco jazz club, Yoshis. The BBQs first CD, Second Nature, features Mikes insinuating ballad, Lydian Grin. He also records and tours with The Crowmatix (featuring Garth Hudson and the late Rick Danko from The Band), which provides an excellent showcase for his talents on slide guitar and mandolin. The Crowmatix have released several CDs, the most recent being Flyin High (Woodstock Records). Jam, the previous release by The Crowmatix, includes Mikes tune, Bayou Blues, praised by Relix magazine as the best cut of the CD. Mike grew up in the arts colony of Woodstock, NY, immersed in the groundbreaking music of the 60s and 70s. He played clarinet in the high school band, then switched to guitar. Early influences  Wes Montgomery, Johnny Smith, Chick Corea, John Coltrane, Miles Davis, Eric Clapton, Muddy Waters, James Cotton, Johnny Winter  helped to shape Mikes sound. At age 18, he gave his first demo tape to blues legend Paul Butterfield. Impressed, Butterfield recommended Mike to Ron Merians, owner of The Joyous Lake, a club renowned for presenting an eclectic mix of cutting edge artists. Merians immediately hired Mike for a steady gig leading his own band. Mike met drummer Dan Brubeck in 1986 and, with keyboardist and composer Vinnie Martucci and bassist Scott Petito, formed The Dolphins, a high-energy fusion band. 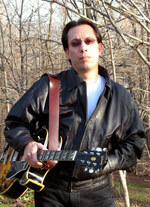 (Bassist Rob Leon joined the band when Petitos career as a recording engineer and producer took precedence.) Three critically acclaimed Dolphins albums, extensive international touring, and U.S. and European concerts with the Dave Brubeck Quartet provided another important springboard for Mikes musical growth. He started his own jazz trio in 1987 with drummer Peter OBrien and, a year later, began his continuing association with pianist Warren Bernhardt. Three highly-acclaimed instructional videos (You Can Play Jazz Guitar, Volumes 1-3, Homespun Tapes) and guest appearances on Homespun videos by Warren Bernhardt and Gary Peacock, as well as numerous university clinics (University of North Florida, University of the Pacific, Pennsylvania State Universities, Bard and Skidmore) highlight Mikes teaching prowess. He received a certificate for outstanding service to jazz education from the International Association of Jazz Educators, and has been awarded two Meet The Composer grants. Mike has also appeared twice on PBS internationally syndicated Jazz in America series.